Stand-up and let your ideas be heard. The AdirOffice Mahogany Floor-Standing Lectern adds style to any presentation, while keeping things organized and running smoothly. The podium is constructed utilizing mahogany wood for long-term durability and use, offered in a mahogany laminate, silver grain or white wood finish to accommodate every style and taste. Fused directly to the surface, each finish is heat-, moisture-, stain- and abrasion-resistant to keep it protected and ensure that it will last well into the future. The full-size reading surface features a 23" width x 15¾" diameter, and includes stylish molding on the bottom for holding all of your presentation material. It slopes at a 15-degree angle to make it easier to read, while a pencil slot at the top allows you to keep writing utensils handy in case the need arises. Inside, an open storage shelf provides space to store equipment, cases and supplies that you may need while making your presentation. It can also be used to store brochures, flyers or other reading material that you may want to hand out to audience members. With its professional look, this lectern is great for making a speech in any conference room, town meeting hall or religious establishment. It’s also ideal to have in the classroom when giving a lecture or in a restaurant so the host/hostess can keep track of reservations and waiting lists. Best of all, this podium can be put together with a screw driver and cam-locks. Floor glides are also included to protect floors from scratches and scuff marks, in addition to making it easy to move from one location to the next. You’ll be up and speaking in no time at all! STURDY, DURABLE CONSTRUCTION. Expertly crafted using mahogany wood to provide long-lasting strength and use, this podium is offered in a mahogany laminate, silver grain or white wood finish to accommodate every style and taste. Fused directly to the wood, each finish is heat-, moisture-, stain- and abrasion-resistant to ensure that it will last you for years to come. PROFESSIONAL LOOK. 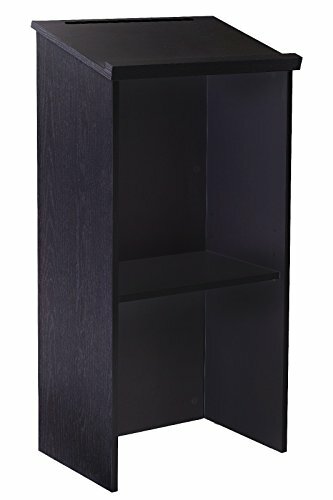 Boasting a standing height of 46" and a reading surface that features a 23" width x 15¾" diameter, this podium will deliver a professional look wherever it's used. The reading surface slopes at a 15-degree angle and features stylish molding on the bottom to prevent papers and books from sliding. Furthermore, a pencil slot on top allows you to keep writing utensils close at hand for added convenience. CONVENIENT STORAGE SPACE. A height-adjustable, open storage shelf measuring 20½" in width x 12¾" in diameter provides a handy place to store equipment, cases and supplies that you may need throughout your presentation. It's also an ideal place to store brochures or flyers that you would like to pass out to audience members before, during or after your speech. MULTI-PURPOSE PODIUM. Adding style to any speech, this lectern can be used in conference rooms, meeting halls and religious establishments to make presentations, in the classroom to give lectures, or in restaurants to keep reservations and waiting lists handy. EASY ASSEMBLY. This podium comes with included hardware for quick and easy installation. Simple to assemble with cam-lock fasteners, it can be put together with a screw driver in no time at all. Floor glides are also included, making it easy to move the piece from one location to the next while protecting the floor from scratches and scuff marks.